Join us for our life-changing Practitioner Training, featuring Neuro-Linguistic Programming, TIME Techniques, Conversational Hypnosis, Emotional Freedom Techniques and Success Coach training. In this incredible training, you'll learn all you need to create amazing changes in your life and the lives of others. NLP training is the quickest and most effective way to gain total conscious and unconscious control of the results in your life. 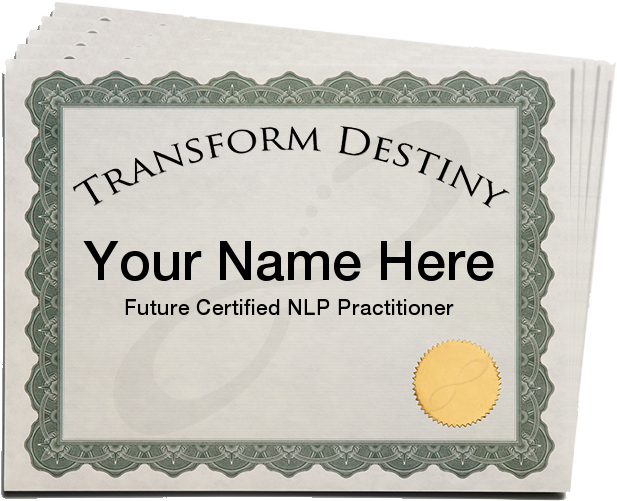 We'll teach you how to use all the NLP Practitioner level tools for both one-on-one use, for coaching and even in your own life. Coaching is one of the leading new professions and offers many personal rewards in the form of personal fulfillment and residual income. Newsweek recently put it bluntly when they said, "Need a life? Get a coach," and claim that successful coaches "earn six-figure incomes, and proponents say the field is about to explode." You'll learn why you might not have achieved goals you set in the past, and how to set achievable goals for the future with the keys to creating achievable goals and outcomes. Learn how to make people instantly like you, both in person and on the phone. Using rapport technology, you can greatly increase your chances of getting your clients to be successful, making sales, networking, making friends and being a powerful persuader. You'll learn how to instantly dislike any tempting food, motivate yourself and change the way you think about anything with the Mapping Across technique. You'll learn how to overcome any bad habit and install positive habits, how to remove triggered negative emotions and how to create a new, powerful identity with the Swish Pattern. You'll learn how to resolve disagreements, think outside the box with the Perceptual Positions technique. Learn how to discover people's strategies for everything from purchasing decisions to deep love, both conversationally and by watching eye patterns. Knowing these strategies allows you to communicate in ways more persuasive and powerful than you've ever experienced before. Learn how to communicate purposefully and with precision so your message is always accepted by others. This is one of the major elements of NLP. With these techniques, you'll learn to empower people through language, learn to be persuasive and influential, and you'll even learn how to hypnotize people conversationally! Learn how you can instantly create confidence, power, determination, motivation, and more with a simple touch. You will also learn how to "collapse" negative states that drag people down. You'll learn how others can anchor you — both negatively and positively — and what you can do to overcome it, how to anchor yourself, and how you can anchor states purposefully in others and use them in influential situations. You'll learn the art of "seeing the other side" of things, which has an almost magical ability to overcome objections, resolve disagreements, change beliefs and more. This is one of the most powerful techniques in the NLP arsenal. Have you ever caught yourself saying, "Well, part of me wants to..." This is a classic indication of inner-conflict — the root cause of many issues — which, when released, will cause most problems to simply disappear. In our NLP training, you'll learn this beautiful technique for easily and elegantly eliminating conflict in yourself and others. Many people believe that coaching is as simple as giving advice. They couldn't be more wrong. Find out why giving advice is the wrong thing for a coach to do, and exactly how you can use all the techniques taught in this training to become a phenomenal coach. T.I.M.E. Techniques™ is one of the most powerful set of NLP techniques to instantly eliminate all negative emotions, release limiting beliefs, undo past decisions, banish the effects of phobias and completely eliminate the emotions of guilt and anxiety. T.I.M.E. stands for Time Integration for Maximum Empowerment. T.I.M.E. Techniques builds on the historic work of Leslie Cameron-Bandler, Richard Bandler, Wyatt Woodsmall, Tad James, L. Michael Hall and Bobby Bodenhammer. If you're familiar with the older timeline techniques, you'll find these updated techniques to be familiar, yet easier, faster and even more powerful. How we Perceive and Interrelate with Time... both neurologically and semantically, and how working with your timeline can create amazing changes in your life and in others. You'll learn a techniques that can eliminate anxious thoughts almost instantly. TIME Techniques™ not only works in the past, but also allows us to definitively put achievable goals into our future with absolute success. Your NLP trainer will teach you powerful techniques for hypnotizing people, both overtly and covertly using conversational hypnotic language patterns. You'll learn the history of hypnosis, and why it's important. You'll learn what the difference is between stage hypnosis and what we do in a clinical setting. You'll learn the myths about hypnosis and how to completely dispel them when talking to others. These tests will allow you to test a persons compliance and suggestibility without actually hypnotizing them. You can use these techniques immediately with anyone you know or don't know. They're great indicators, and they're fun, too! You'll discover how to use all the tools you've learned over the seven day training to help people lose weight, quit smoking and more. EFT™ — sometimes referred to as Energy Tapping — is a revolutionary set of techniques designed to balance the energy system of the body, removing the effects of negative emotions and eliminating addictive cravings, such as those from cigarettes, alcahol and drugs. EFT is based on the same scientifically proven principles as accupuncture, but is easy to use by simply tapping on parts of your body. You'll learn the scientific basis for EFT, based on the same energy systems used in accupuncture, discovered thousands of years ago by the ancient Chineese. You'll discover the areas on the body where energy paths intersect — those places that create the most dramatic effects with tapping. Including intervetions for frustration, fears and phobias, road rage, post-traumatic stress, smoking and weight loss. Psychological Reversal is, quite literally, the cause of self-sabotage, negative self-talk, and chronic illness. This technique virtually guarantees to correct phsychological reversal of the energy system. Learn how to coach yourself and others to success with the simple seven-step CORE Success Coach Method, created by NLP Trainer and Founder of Transform Destiny, Michael Stevenson, and based on the principles of Neuro-Linguistic Programming and Coaching. PLUS, learn the business of coaching — how to market yourself in the real world. These trainings are fully accredited and meet the standards for certification by the International Board of Coaches and Practitioners so your certifications have world-wide recognition. Pre-Study - Our accelerated format begins with you. We will send you an audio program and some easy-to-read books to study at home. Then, when you come to the training, you'll have a foundation of knowledge that will allow us to give you a full Practitioner education in a short period of time. "I can tell Michael cares about his students." "This has been a life changing experience, well worth the investment." "Very good presentation. Lots of personality!" "Great attitude and fun! Well done!" "Totally amazing. I can't wait to get out in the real world and use this stuff." Click here to read more testimonials from our graduates. Ryan Simmons, our Lead NLP Trainer is an author, success coach, and successful speaker with impressive credentials and experience. The trainers at Transform Destiny have helped more than 100,000 people around the world learn to use the power of the mind to turn off the "autopilot," take hold of the controls and create the life their dreams. You can read more about Ryan by clicking the link to his bio above.